Returning from Granton recently, I decided to look in at Montrose Bay at Rosetta, a northern Hobart suburb. I was primarily interested in looking for the Little Black Cormorant that usually roost on the small wooden jetty (now condemned), together with Great and Little Pied Cormorant. And indeed I found all 3 on the jetty, enjoying what I suspect is a brief respite before the jetty is demolished, as there's a new, all concrete one, a short distance away. But my interest turned to the flock of around 50 Pied Oystercatchers, feeding on the grassed area behind the yacht club. I've found them in this area before, feeding on the nearby, well manicured and watered playing fields of the local school. But as they were being mown, the oystercatchers were making the most of the public area, only 20 or 30 metres away from one of the state's busiest highways, the 'Brooker". I was intent on getting a few shots of them as they fed, but not too close as to flush them, which proved fairly easy, despite the to'ing and fro'ing of cars and people to the nearby children's play area. I walked back to my car, noting a fe w oystercatchers roosting on the grass near the yacht club, one of which flew up onto the roof of a nearby building, joining a few loafing Silver Gulls. That at least I hadn't noted before, and wondered whether the POs regularly use this roof to roost on, particularly at times when this council recreation area is in full swing. That would certainly be unusual, and well worth looking out for. The use by Pied Oystercatchers of grassed areas to feed, often well away from their usual haunts, as in this case, appears to be a fairly recent change of habit. I've also noted them feeding on grassed areas at Dover, Gordon and Franklin. Perhaps with sea levels rising, this will become the norm amongst our oystercatcher population, and regularly choosing to roost on roofs inevitable. 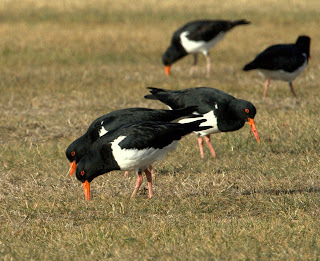 I saw the pied oyster catchers at Montrose Bay as I drove past on route to Granton. I noticed two large groups feeding on the grass. At Granton I saw some extraordinary behaviour from a pelican. The pelican had been preening until a black swan came within close proximity. The pelican lifted one leg and adopted an aggressive pose, so bizarre to observe that I cannot describe it. I wonder if this is common behaviour - I will email a photo of the pelican. Thanks for your interesting observations, I've just received your images. Its always difficult interpreting interactions of this kind, probably because we're seeing it from a human perspective. Pelicans' threat display is usually accompanied by 'gaping', fully opening of the bill, sometimes with neck extended. It may be that the Black Swan read the 'signs' and the pelican didn't need to proceed to that point. Pelicans can be surprisingly aggressive, especially when feeding. This reminded me of the related Pied Oystercatchet in Scotland - Haematopus ostralegus. They are very common on playing fields, school grounds (even during lunch) and on rooftops and highway roundabouts. They have also been recorded nesting on roofs. Their behaviuor has also been seen to have changed of the last century or so from being exclusively a coastal breeder to now breeding regularly along inland rivers and lakes. See "The State of the Nations Birds" by Chris Mead for a little more info. Thanks for your comments. The POs here are, slowly but surely, regularly feeding on sports grounds, or anywhere else that the ground is soft enough to allow them to probe for grubs and worms. 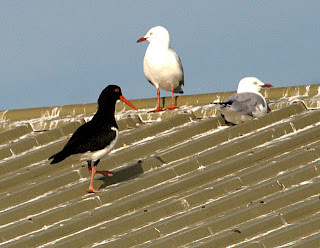 Perhaps the next step, at least at Montrose Bay, is to roost on rooftops. With coastal areas under threat from rising sea levels and loss of habitat, by development and disturbance, they may well have to find other strategies, for feeding, roosting and breeding. Lovely blog you've go here. This post is almost confusing for me - gulls and oystercatchers, placenames like Montrose and Granton - could almost be Scotland!